P.S. 271 is among the most diverse elementary schools in the city. Located in District 22 in Brooklyn, it is a Title I school whose families speak numerous languages, including Urdu, Bengali, Arabic, Spanish, Nepali, Uzbeki and Russian, and a considerable portion of the student population is Muslim. For years, parents have wanted more nutritious lunch options for our children, many of whom receive school lunch. In particular, we wanted more Halal-friendly offerings. Because so many children cannot eat non-Halal meat and the vegetarian options were almost nonexistent, many kids were not able to eat a proper nutritious meal during the school day. Despite numerous requests over the years, we were not able to make progress getting the school to change its menu. Finally, with the help of a parent at our school who is also a community organizer, we came up with a plan for change. First, it was important to get a more comprehensive idea of the school lunch issue. We organized a meeting with someone from Community Food Advocates, who let us know about the relevant DOE regulations, what options were available for our kids, and the process for changing a school menu. After that, we met with the School Food Manager at our school so she could hear from parents about why this issue was so important and we could hear her perspective. Next, the Community Engagement Committee was created; it met every Friday morning and was responsible for outreach and conversations with parents about the effort, letting them know about our goal and getting them involved and excited. Committee members created flyers, which were translated in multiple languages, to inform parents about the plan and invite them to meetings. 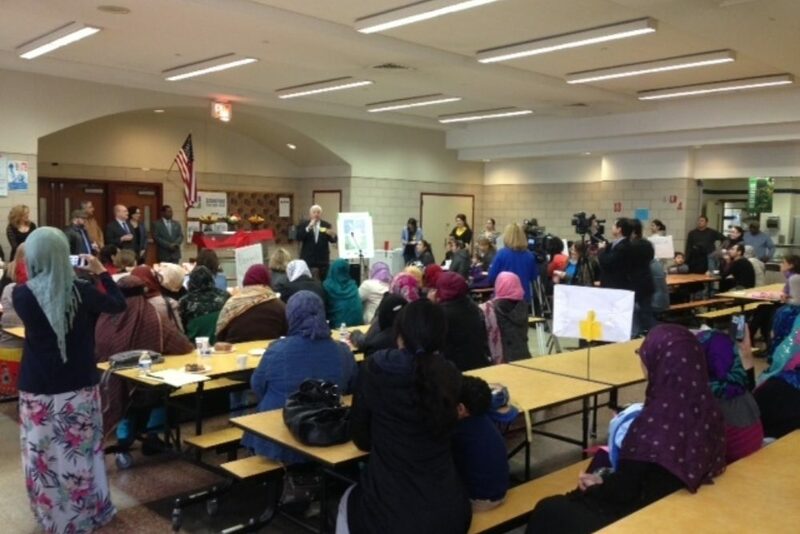 We also recruited parents and neighborhood volunteers to help translate in multiple languages and speak publicly at PA meetings, so that parents of all cultural backgrounds would feel more comfortable attending. We drafted a petition, attached below, stating that parents wanted a new lunch menu for their children. We asked parents to sign the petition in the schoolyard (having parents sign petitions inside schools is not allowed). Many parents did not think the menu would ever change because it had been talked about for years without results, but they still signed, and many took petitions to circulate with their friends and neighbors. We ended up with over 400 signatures. We brought the initiative to the attention of elected officials and other community leaders, including our State Assemblyman, City Council members and District Leader, as well as neighborhood-based organizations. The number of signed petitions convinced them that this was an issue of importance to our school community. The elected officials signed the petition as well. With their backing, we were able to secure a meeting with DOE School Food personnel (see a copy of the letter we sent below). Prior to the meeting, we did our homework, so to speak: we spent time going through the School Food website, reviewing possible menu options, speaking with others who had been through the process, and discussing our priorities. At the meeting with parent leaders, the principal and the DOE School Food personnel told us how impressed they were by our level of knowledge of the process and different options. We realized that taking the time to do prepare was critical to our success. DOE agreed to implement its “alternative” menu the following month, as well as install a kid-friendly salad bar and round, compostable plates, and the principal offered to promote the new menu in classes through a healthy eating curriculum. On May 1 2015, we held a special event to celebrate the launch of our new, vegetarian-friendly menu, as well as a salad bar. Meals will include as Kung Pao tofu, vegetarian chili, curried tofu rice bowls, kale salad, braised collards, and more. Parents are now observing in the cafeteria to see and document how the menu is working, and we are in regular communication with the cafeteria staff so that we can support them and improve the transition. We are so proud of our community for accomplishing this goal, thankful to all of those who supported our efforts, and thrilled for our children, who will be able to eat healthy, delicious meals that will sustain them throughout the day. Health and wellness Created with Sketch.